A little tongue twister for you on this chilly Saturday afternoon! 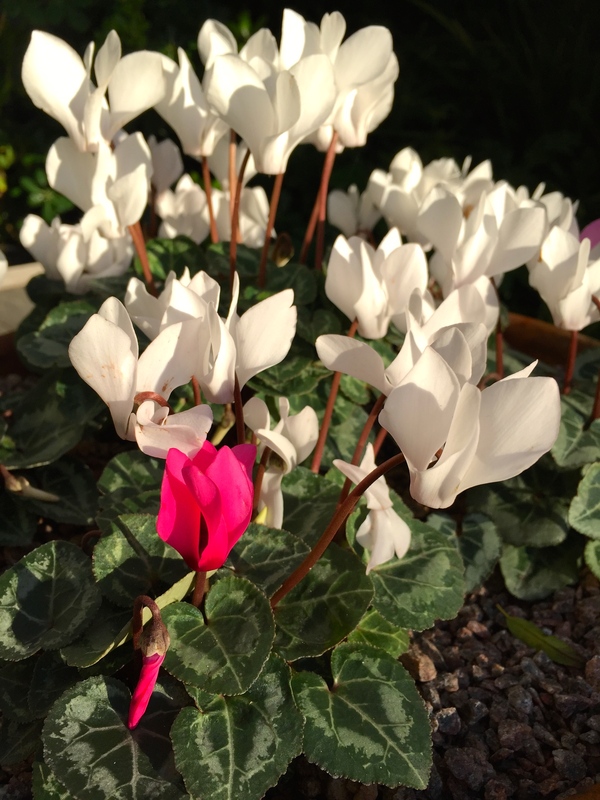 I refer to a certain magenta marauder that’s found its way into a bowl of pure white cyclamen on our garden table. The vermillion villain must have crept in as a wayward seedling, biding its time before surprising us with a daring dash of flaming fuchsia. Given the scarcity of flowers outside in December I am loath to cleanse the arrangement of our scarlet scoundrel, so will leave him be. A drop of blood-red does, after all, feel symbolic given the rapid approach of Christmas. Folks, we have a carmine criminal in our midst! I love it when a plan doesn’t come together! It has happened often in my garden… loved this post! Lol! Clever. I like how it is snowing on your site too! Thank you Cynthia. I am never quite sure if the snow is annoying or not, so happy to hear you like it!